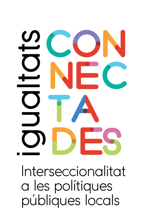 Igualtats Connect | The training and debate cycle on intersectionality is already underway! 15 Oct The training and debate cycle on intersectionality is already underway! The training and debate cycle of on intersectionality in the city began on September 26 with the session by Lucas Platero: Intersectionality. What is it and how can we put it into practice? More than 170 people attended this session, which reaffirms the relevance of this topic for citizens. The second session, Intersectionality in social movements: experiences and challenges, performed by Sam Fernández also had an audience that exceeded 150 people. You can watch the videos of the complete sessions here.